Martin de Tours Clothier proudly introduces their made-to-measure new menswear collection of suits and dress shirts. The new Martin de Tours Clothier Fall 2013 collection is available for purchase via their ecommerce at http://www.mdtclothier.com. New York based company, Martin de Tours Clothier proudly introduces their made-to-measure new menswear collection of suits and dress shirts. The new Martin de Tours Clothier Fall 2013 collection is available for purchase via their ecommerce at http://www.mdtclothier.com. Martin de Tours Clothier is an up and coming brand that is going to change the way consumers think about men’s suits and dress shirts, ultimately incentivizing them more to purchase suits and dress shirts that are made-to-measure than off the rack. The Martin de Tours Clothier style valets that are top fashion consultants can help measure and find the best suit and dress shirt for any occasion for their guest. Martin de Tours Clothier takes the approach that every customer is a guest and should have the look they desire and the best fit possible. The Martin de Tours Clothier new Fall 2013 collection proves you don’t have to sacrifice quality, comfort and style with their affordable suits and dress shirts. Martin de Tours Clothier introduces their Prerequisite, Signature and Heritage for their new Fall 2013 collection. All suits are 100 percent wool and dress shirts are 100 percent cotton with styles that range from mainstream to contemporary. All of this can be purchased online and the best part is you have your very own style valet to help you find the best item and items for your exact measurements and style preference. Martin de Tours Clothier offers high quality made-to-measure menswear custom suits and dress shirts with the finest fabrics to exceptional service provided by a personal style valet to each guest. For more information and to purchase Martin de Tours Clothier online, visit http://www.mdtclothier.com or order by calling 800-638-0817. 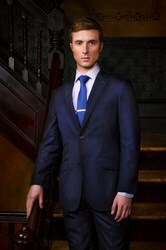 Martin de Tours Clothier is a luxury ready-to-wear menswear line. Made from the finest materials, each item is custom made and offered at an affordable price. The company produces beautiful tailored-made suits and dress shirts. More than a brand, Martin de Tours is an accessible lifestyle from providing value and convenience to offering top style valets, VIP exclusives and events to superb service for their guests. For more information on Martin de Tours Clothier and its products, visit http://www.mdtclothier.com and Facebook via facebook.com/MdTClothier and Twitter via twitter.com/MdTClothier. Tamara York Public Relations, LLC.